It’s important that you choose the right table size for your room size and the age and skill level of the players for maximum enjoyment! What Table Size is Right for My Room? Don't have a game room? Consider a dining room conversion pool table! The right pool table cloth is integral to both the playability of the table and the decor of your game room. Don’t underestimate the importance of your cloth selection, it affects performance. If you want to play better, your cloth has to be better. Lighting your pool table is the second most important purchase after the pool table. There must be enough bright light over the table to see the entire playing surface without shadows. If the room is too dark, the players eyes might get tired as well. Ambient room light isn't sufficient to light a pool table. You'll see your own shadow on the table. When you set up your living room, you don’t just put in a couch and call it a day. Your game room deserves the same attention! Your family and friends need a place to sit between shots, or just watch the fun. Game room furniture you can add includes chairs, tables, benches and cue racks. One of our most popular items is the Spencer Marston Deluxe spectator chair with the built-in storage drawer. 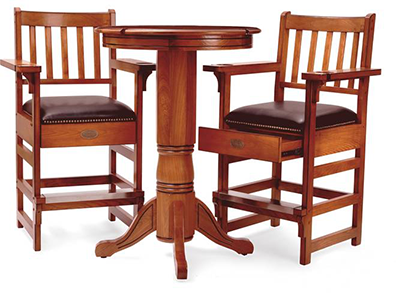 It also comes in a set with a matching table, the Spencer Marston Pub Deluxe Plus. Spencer Marston furniture and accessories are offered in stain colors that match table models. If you’re undecided on your color palette, contact us to request wood stain samples. 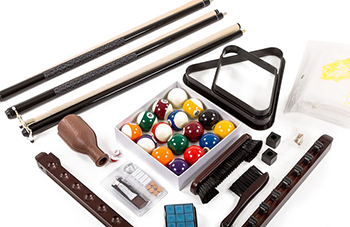 Accessories come in many shapes and sizes: they include ball sets, cues and chalk, table maintenance items and storage options (benches). We have many options for game room accessory storage, depending on your available space and room configuration. If your space is limited, consider rack packs that match our pool tables in style and stain color. Rack packs include upgraded ball sets and cues, and provide handy storage for all your game room accessories. Check out a corner rack pack or a wall rack pack. A pool table cover will protect your investment. UV rays from direct sunlight will quickly fade the cloth on your table. A table cover will also protect the surface from dust, food or spills, or other mishaps. Do you have pets? Just like their hair gets on everything else in your house, it will get on the pool table, and will affect play. And do you really want your dog or cat to be able to jump on the table and potentially rip the cloth with their claws? If you’re just shooting around with family and friends for fun, our basic pool ball sets will be just fine. But if you are serious about your billiards game, we recommend upgrading to billiard balls made of phenolic resin. We carry two sets: the Aramith Premium Ball Set, and the Brunswick Centennial Ball Set.